Good day to all the awesome people! 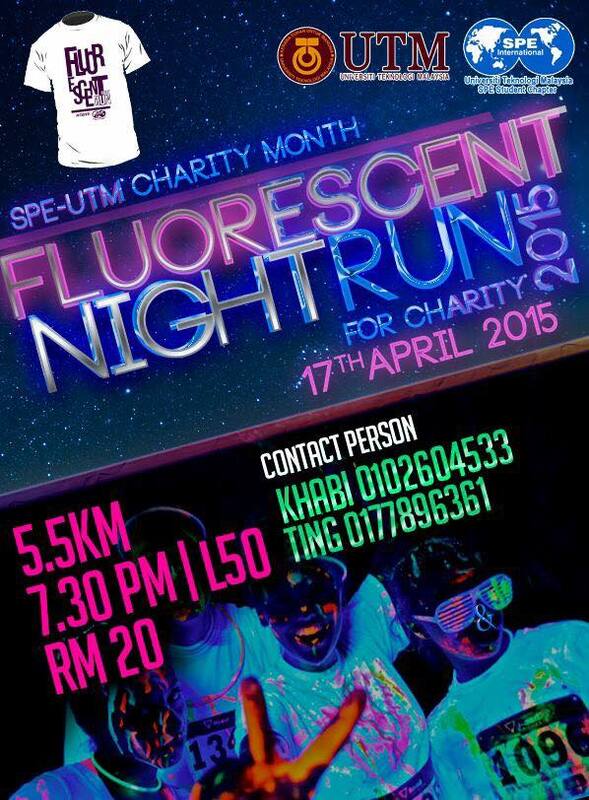 Let’s join the first event for SPE UTM Charity Month 2015-Fluorescent Night Run! “Fluorescent Night Run” is a new approach whereby you guys should DEFINITELY participate in. The clock is ticking and you should quickly register yourself to this MOST ANTICIPATED event of the year. The fees include t-shirt, glow sticks and certificates. Medals will be given for the top 20 for both men and women categories. So what are you waiting for? Register now!! Pssst….the brand new running event that will definitely set a trend out here. Do you want to be a trend setter? Then, dont hesitate anymore. Event categories: Campaign, Open to Public, Social, Sports, and Students.